This page covers the author of Ulysses. For other authors named James Joyce, see the disambiguation page. «Quando nos lembramos de que Dublin é uma capital há milhares de anos… parece estranho que nenhum artista a tenha oferecido ao mundo.» (James Joyce, em carta ao irmão) Aos vinte e cinco anos, Joyce completou "Dublinenses" – uma sequência de pormenorizados episódios que retratam a vida da classe média de uma Dublin católica. As frustrações da infância, as desilusões da adolescência e o despertar sexual são narrados com clareza e sensibilidade. No conto mais famoso, «Os Mortos», Joyce descreve uma festa natalícia de amigos e vizinhos. Existe, porém, uma tensão oculta e um sentimento de desespero no enredo, que confere um elemento perturbador às aparências desse episódio social.O realismo e simbolismo do imaginário de Dublinenses criaram uma nova forma de escrita, que é tão impressionante hoje como quando surgiu em 1914. "Dublinenses"- James Joyce; Relógio D'Água. A novel, a short story collection, an encyclopedic collage—authors talk the myriad forms a story can take. Catherine Bush moderates. Catherine Bush is the author of four novels: Amazon.ca Best Book Accusation, the Trillium Award-shortlisted Claire’s Head, The Rules of Engagement (which was chosen as a New York Times Notable Book) and Minus Time. Her non-fiction has appeared in the anthology The Heart Does Break and elsewhere. She coordinates the University of Guelph Creative Writing MFA. Emma Donoghue is a writer of contemporary and historical fiction whose eight novels include the internationally bestselling Room—winner of both the Commonwealth Writers’ Prize (Canada and Caribbean Region) and the Rogers Writers’ Trust Fiction Prize, and a finalist for the Man Booker Prize—as well as Slammerkin, Life Mask and The Sealed Letter. She lives in London, Ontario with her partner and their two children. Donoghue presents her latest novel, Frog Music, a lyrical tale of love and bloodshed among lowlifes in San Francisco in 1876. Aislinn Hunter’s acclaimed collection of stories, What's Left Us, was a finalist for the Danuta Gleed Award and the ReLit Award, and her poetry, Into the Early Hours, was shortlisted for the Dorothy Livesay Poetry Prize and won the Gerald Lampert Memorial Award. Hunter’s novel Stay was a finalist for the Amazon.ca First Novel Award and was recently adapted for film. She presents The World Before Us, her first book of fiction in 12 years. It is a riveting exploration of the repercussions of small acts, the power of affection and the irrepressible vitality of everyday objects and events. Eliza Robertson studied creative writing at the University of Victoria, then pursued her MA in prose fiction at the University of East Anglia, where she received a Man Booker Scholarship and the Curtis Brown Prize for best writer. She was a finalist for the 2013 CBC Short Story Prize, won the Commonwealth Short Story Prize for "We Walked on Water," and her short story "My Sister Sang" was shortlisted for the 2013 Journey Prize. Robertson presents her debut collection, Wallflowers, a quirky and masterful bouquet that smashes stereotypes and shows us remarkable new ways of experiencing the world. Diane Schoemperlen has published several collections of short fiction and three novels. Her short story collection The Man of My Dreams was shortlisted for both the Governor General’s Award and the Trillium Book Award. In 2008, she received the Marian Engel Award from the Writers’ Trust of Canada. Schoemperlen presents By the Book: Stories and Pictures, a sequel to her Governor General’s Award-winning Forms of Devotion, in which she pieces together fragments from old encyclopedias in the form of verbal and visual collage, breathing new life into the old forgotten texts. Writers Steven Galloway, Aislinn Hunter, Lee Maracle and Carrie Snyder read from their latest works. Steven Galloway is the author of Finnie Walsh, Ascension and the bestselling novel The Cellist of Sarajevo. He lives with his wife and two young daughters in British Columbia, and teaches creative writing at UBC and SFUH. Galloway presents his latest novel, The Confabulist, a brilliant story about fame and ambition that uses the sudden death of Harry Houdini to weave a magical tale of intrigue, love and illusion. Lee Maracle has been published in anthologies and scholarly journals worldwide, and is the author of a number of critically acclaimed novels and works of non-fiction. She was born in North Vancouver and is a member of the Stó:lō Nation. She is currently an instructor at both the University of Toronto and Banff Centre for the Arts, and has received the Diamond Jubilee Medal for her work promoting writing among Aboriginal youth. Maracle presents her latest novel, Celia’s Song, which chronicles one Native family’s harrowing experiences over several generations, after the brutality, interference and neglect resulting from contact with Europeans. Poet Jacob McArthur Mooney's last collection, Folk, was shortlisted for the Dylan Thomas Prize and the Trillium Book Award in Poetry. He curates and hosts the bi-weekly Pivot Reading Series in Toronto. Carrie Snyder is the author of two books of short fiction. Her first, Hair Hat, was shortlisted for the Danuta Gleed Literary Award for short fiction, and her second, The Juliet Stories, was a finalist for the 2012 Governor General's Literary Award. Snyder lives in Waterloo, Ontario and blogs as Obscure CanLit Mama. She presents Girl Runner. Part historical page-turner, part contemporary mystery, it is an engaging and endearing story about family, ambition, athletics and the dedicated pursuit of one’s passions. It’s Bloomsday again! Join us for our own mini-marathon reading of James Joyce’s Ulysses, the famous novel that rambles around Dublin. Marathon readings of this modernist masterpiece can go on for days, but P&P’s little version will last just over an hour. Volunteer to read a short prepared portion of the novel as straight or as fulsome as you wish. We’re in the midst of a global appetite for all things Scandinavian: furniture, television, and especially food. René Redzepi’s Copenhagen restaurant, Noma, is ranked number two in the world – and he’s become a global success by focusing on regional, seasonal Nordic cuisine. It’s a philosophy that chimes perfectly with the times. He’s been described by the Guardian as ‘a gifted cook with an extraordinary palate’ and the ultimate antidote to ‘beige’ dining. In partnership with the Age Good Food Month, we’re bringing this global superstar to Melbourne. Set on this day in 1904, James Joyce’s Ulysses took Buck Mulligan, Stephen Dedalus, Leopold Bloom, Molly, and a host of other Dubliners through a typical Thursday. Mark the occasion by signing up for a short reading at Politics & Prose Bookstore at noon (email Shane Cagney: scagney@politics-prose.com), then continue festivities at James Hoban’s, 1 Dupont Circle for another reading sponsored by the Harvard Club of Washington DC (email Bob Kolodney: rbk987@verizon.net). Brands in Donner. Het boekenprogramma met Wim BrandsOp zondag 3 februari heeft Wim Brands wederom een veelzijdig gezelschap uitgenodigd. Vertalers Erik Bindervoet en Robbert-Jan Henkes, kunstjournalist Gijsbert van der Wal en Elsevier-redacteur Gerry van der List. Het belooft weer een mooie middag te worden waarvoor u van harte uitgenodigd wordt!Erik Bindervoet (1962) en Robbert-Jan Henkes (1962) schreven samen romans, essaybundels en pamfletten. Daarnaast verwierven ze grote bekendheid als vertaler. Vooral hun vertaling van het onvertaalbaar geachte Finnegans Wake van James Joyce oogstte grote bewondering. Afgelopen zomer publiceerden ze hun vertaling van Ulysses, onder de nieuwe titel Ulixes. Bepaald geen eenvoudig boek om te lezen, en dus bedachten ze, bij wijze van literaire nazorg, de cursus Ulysses-lezen. Kunstjournalist Gijsbert van der Wal schreef Wijd open ogen. Stukken over kunst en kijkplezier. Kunst raakt je als je er iets in herkent. Al die persoonlijke zaken maken dat je je in een kunstwerk op je gemak kunt voelen. Andersom kan je persoonlijke leven plezieriger en rijker worden als je er via de kunst naar kijkt. Voor Gijsbert van der Wal is de aanwezigheid van kunst in zijn leven een volstrekte vanzelfsprekendheid. Met die vanzelfsprekendheid als uitgangspunt schrijft hij de meest verrassende dingen over kunst. Op 2 maart 2013 is het honderd jaar geleden dat Godfried Bomans werd geboren. Bomans was vele jaren de meest gelezen schrijver van Nederland. Tijdens zijn leven kreeg Bomans weinig officiële erkenning, in elk geval niet in de vorm van een literaire prijs. Dankzij opvallende tv-optredens werd hij wel een nationale en zeer geliefde bekendheid. Elsevier-redacteur Gerry van der List, die eerder de succesvolle bundel Genieten in een gekkenhuis samenstelde met de verhalen van Bomans voor Elsevier, beschrijft in Ter herinnering Godfried Bomans (1913-1971) het leven van de markante schrijver.U bent van harte welkom op zondag 3 februari om 14.00 uur (inloop met koffie en thee om 13.30 uur) in het theater in de kelder! 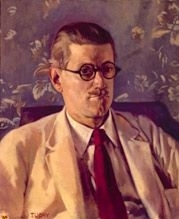 James Joyce has a Legacy Library. Legacy libraries are the personal libraries of famous readers, entered by LibraryThing members from the Legacy Libraries group. » James Joyce's legacy profile. "James Joyce" is composed of at least 3 distinct authors, divided by their works. You can edit the division. James Joyce is composed of 14 names. You can examine and separate out names.